AM/FM/SW1-7 Radio. Carrying Strap. USB/TF Card. • 15” Woofer. BATTERY POWERED BLUETOOTH PA SPEAKER. WIRED MICROPHONE AND STAND INCLUDED. • Microphone Input. 15” PORTABLE PARTY SPEAKER. Bluetooth version: V4.2. Speaker output : 40W. FM RADIO AND USB/SD. 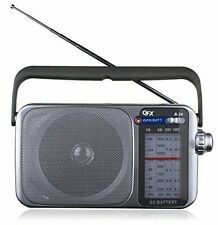 Title: QFX R24 Portable AM FM SW1 SW2 Radio Silver. 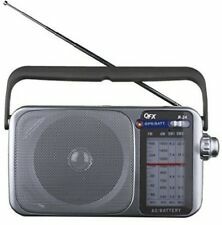 QFX R24 Portable AM FM SW1 SW2 Radio Silver. Enjoy your favorite AM, FM, and shortwave radio stations with the powerful sound of QFX’s retro-styled, handheld 4-Band Radio. Enjoy high-quality portable sound with the black R-3 Portable AM/FM/SW1/SW2 Radio from QFX. 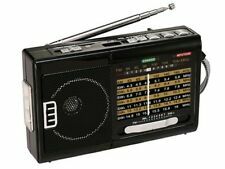 This retro-styled, four-band radio allows you to listen to your favorite AM, FM, and shortwave radio stations. Never be at a loss for music when you carry around this handy radio. Good luck! BLUETOOTH/USB/TF/FM. DC 5V USB Charging Port. USB/TF Port. USB Charging Cable. RGB LED Disco Light. Unit Weight: 0.90 LBS. Color: Black. Good luck! AM/FM/SW1-7 10 BAND RADIO. AM/FM/SW1-7 Radio. Carrying Strap. Sorry, no cash, COD, or personal checks. Unit Weight: 0.5 LBS. Unit Size: 3.5x5.4x1.6. Never Used! Portable Party Bluetooth Loudspeaker Party Music Speaker Microphone Remote 8"
QFX's Portable PARTY Speaker has you covered for any occasion. Once it's in place, it can stream music from a variety of sources: wirelessly via Bluetooth-enabled devices, through USB and microSD card slots, or connected with a cable through the aux-in port. Enjoy your favorite AM, FM, and shortwave radio stations with the powerful sound of QFX’s retro-styled, handheld 4-Band Radio. AM/FM/SW1-SW2 Radio. 4 Band Radio. DC 4.5V Jack. AC 120-240V. Handel Bar. Good luck! Enjoy your favorite AM, FM, and shortwave radio stations with the powerful sound of QFX's retro-styled, handheld 4-Band Radio. Headphone Jack 3.5mm. High Power Dynamic Speaker. 4 Band Radio. Built-in Lithium 1200mAh Battery. COLORS: BLACK, RED, BLUE, CHARCOAL. Headset Microphone. Take the party wherever you go 3400W Speakers provide loud clear sound 6.25" Woofer delivers deep crisp bass Stream audio wirelessly from Bluetooth-enabled devices USB port and Micro SD card slot allow you to play digital audio files FM radio 5-Band equalizer with integrated controls LED disco lights set the mood Built-in 1800mAh rechargeable battery provides up to 14 hours of playback on single charge Sturdy integrated handles for easy transportation LED Battery indicator Dimensions: 16.53"L x 8.38"W x 9.84"H Includes AC charging cord . Trending at $85.14eBay determines this price through a machine learned model of the product's sale prices within the last 90 days. 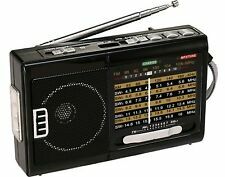 Product Title QFX Bluetooth AM/FM/SW 3 Band Radio (RETRO90). Manufacturer QFX, Inc. Product Type Radio Tuner. Tuner Analog. Bluetooth Yes. Battery Chemistry Lithium (Li). Connectivity Technology Wireless. QFX’s Portable PARTY Speaker has you covered for any occasion. Once it’s in place, it can stream music from a variety of sources: wirelessly via Bluetooth-enabled devices, through USB and microSD card slots, or connected with a cable through the aux-in port. QFX's Portable PARTY Speaker has you covered for any occasion. Much like a suitcase, it has a handle and wheels, so it'll be easy to transport. Once it's in place, it can stream music from a variety of sources: wirelessly via Bluetooth-enabled devices, through USB and microSD card slots, or connected with a cable through the aux-in port. Kick it old school with QFX’s AM/FM/shortwave/cassette player, the ReRun. Bust out those Wu-Tang tapes from high school and a couple of D batteries for hours of stripped-down beats and bass-heavy nostalgia on the go! Disco lights flash from the full-dynamic speaker as you enjoy your favorite AM, FM, and shortwave radio stations with the powerful sound of QFX’s 12-Band Radio. 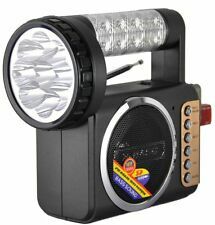 QFX Portable AC/DC/FM/AM/SW1-SW9 RADIO Disco Light Speaker. Good luck! For those of you with cassettes, your best chance to get the songs on your iPod is through a cassette to MP3 converter. This Portable Cassette Boom box lets you take your favorite cassettes and preserve them in digital format. Trending at $33.35eBay determines this price through a machine learned model of the product's sale prices within the last 90 days. Good luck! TRANSLUCENT PICK-UP TRUCK WITH DISCO LIGHT. USB to Mini USB Charging Cable. PICK-UP TRUCK TUNES. MINI MUSICAL PICK-UP TRUCK. Unit Weight: 1.80 LBS. Sorry, no cash, COD, or personal checks. 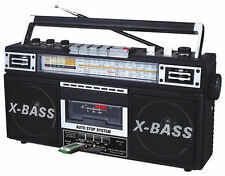 QFX J22U AM FM SW1 SW2 Cassette Player Recorder MP3 Player Boombox. Condition is Used. For those of you with cassettes, your best chance to get the songs on your iPod is through a cassette to MP3 converter. Good luck! This portable and compact AM/FM /SW radio is the perfect fit for rooms where space is at a premium. It features a new LED battery status indicator and runs on two AA batteries - so whether you're listening through the built-in speaker or via the dedicated headphone socket, you'll always be able to enjoy great sound. QFX J22U Retro Mini Boombox AM FM SW 4 Band Radio Cassette RecorderUSB SD MP3 PLAYER Black [New Misc] Black. Tapes starting to get that persistent hiss?. RADIAND CASSETTE TMP3 CONVERTER. AM/FM/SW1-SW2 4 BAND RADIO. LED LIGHT BLUETOOTH SPEAKER. BATTERY POWERED BLUETOOTH SPEAKER. FM RADIO AND USB /TF PORT. • FM Radio. • Bluetooth. • 2.25” Speaker. • Colors: Black. • USB DC 5V Charging. Good luck! 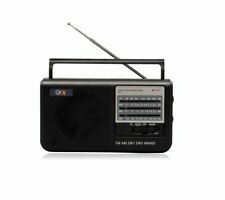 Enjoy your favorite AM, FM, and shortwave radio stations with the powerful sound of QFX's retro-styled, handheld 4-Band Radio. LED Power Indicator. High Power Dynamic Speaker. Sorry, no cash, COD, or personal checks. 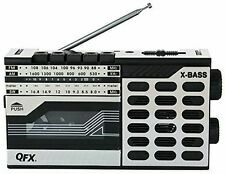 QFX J-22UBK ReRun X Radio and Cassette to MP3 Converter. RADIO AND CASSETTE TO MP3 CONVERTER. For those of you with cassettes, your best chance to get the songs on your iPod is through a cassette to MP3 converter. Tapes starting to get that persistent hiss?. Stereo Earphone Jack 3.5mm. Built-In Speaker. QFX Bluetooth PARTY Speaker has you covered for any event. Much like a suitcase, it has a handle, so it'll be easy to transport. This Little guy can stream music from a variety of sources: wirelessly via Bluetooth-enabled devices, through USB and SD card slots, or connected with a cable through the aux-in port. Good luck! FM RADIO AND USB /TF PORT. LED LIGHT BLUETOOTH SPEAKER. BATTERY POWERED BLUETOOTH SPEAKER. 2.25" Speaker. USB /Micro-SD Card. USB DC 5V Charging. Unit Weight: 1 LBS. Item has been tested for functionality and works perfectly. Enjoy your favorite tunes while you shower with the QFX Bluetooth shower speaker and mirror. Not only does it play music and let you answer phone calls from the shower, it Features a fog-free mirror and light for grooming, too. TWS works only via Bluetooth for this model. Good luck! BLUETOOTH/USB/TF/FM. DC 5V USB Charging Port. USB Charging Cable. RGB LED Disco Light. Sorry, no cash, COD, or personal checks. UPC: 6 06540 03870 3. This translucent pick-up truck was designed with disco lights and AUX-IN so you can plug and play with your favorite playback device with the included 3.5mm AUX cable. PICK-UP TRUCK WITH BLUETOOTH. TRANSLUCENT PICK-UP TRUCK WITH DISCO LIGHT. Sorry, international expedited service is not available. Sorry, international expedited service is not available. You should see the option when you check out. QFX PBX-7 Portable Bluetooth Speaker. Connecitivity: Bluetooth. Type: Tailgate Portalble Speaker. User Guide. Color: Black. Doing this lets us also keep perfectly good products from being wasted in a landfill. New without box. 7 Band Equalizer. 1.5" Tweeter. 2x8" Woofer. PORTABLE BATTERY POWERED PA BLUETOOTH SPEAKER. 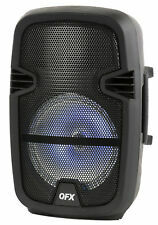 QFX Battery Powered PA Speaker. Unidirectional Dynamic Microphone Included. 2 Microphone Input. FM Radio, Detachable Antenna. Take your tunes on the go with the black QFX Bluetooth Jumbo Boombox. It also has a CD player, AM/FM radio, a USB port for playing MP3 files off a USB thumbdrive, a cassette recorder with auto-stop, and a 3.5mm AUX port for connecting wired devices. Format: Headphones, Black,ON-EAR Headphones,Bluetooth. Bluetooth V3.0 EDR. Bluetooth protocol: A2DP/AVRCP. Sorry, international expedited service is not available. Blu-ray and DVD Region Codes. Range 40 Feet. PBX-885 2x8” PORTABLE PARTY SPEAKER. RGB LIGHT 2x8” PORTABLE PARTY SPEAKER. • 2x 8” Woofer. • Microphone Echo. BATTERY BLUETOOTH PARTY SPEAKER. • Bluetooth. • Microphone Input. FM RADIO AND USB/SD. QFX’s portable Bluetooth boom box features a top-loading CD and cassette player, and includes both a USB playback function and FM tuner. Portable Bluetooth Jumbo Boombox. Type Wireless Boombox. Bluetooth Wireless Connectivity. Good luck! Rewind and unwind to the soothing tones of your favorite golden oldies station with the RETRO-100 AM/FM tuner or check to make sure no one is watching and pair your space-age Bluetooth device for hours of handsfree grooving. R30U- Am/FM/Sw1-Sw2 Radio. Headphone Jack. Full Dynamic Speaker. QFX PD-43 Portable System 4.3TFT Screen FM Radio - New!